At work there are some snack vending machines as well as coffee machines. They all work with the same payment system: either you add coins or you can recharge your account, getting identified thanks to your badge. It seemed pretty obvious to me that there were no server to manage your account so I wanted to know how my money was saved. The most obvious solution I thought about was that everything was saved on the card - and I was right! Please remember you are not allowed to add money you don't own to this kind of cards. This article is only about explaining how unsecure this payment method is. I am not responsible for the use you will make of the knowledge I provide. First of all, I had to find what kind of NFC tag was used by the card. I used a free Android App for that: NFC Tools which is able to provide basic information on tags and more if they are not secured. The tag appeared to be a MIFARE 4K from the MIFARE Classic Family, these tags are pretty common for this kind of applications, which is quite sad regarding to what is written in the specs : "The MIFARE 4K platform is a low-end memory technology and should be considered to provide only minimal security. As such only free-read data elements should be held on this platform.". 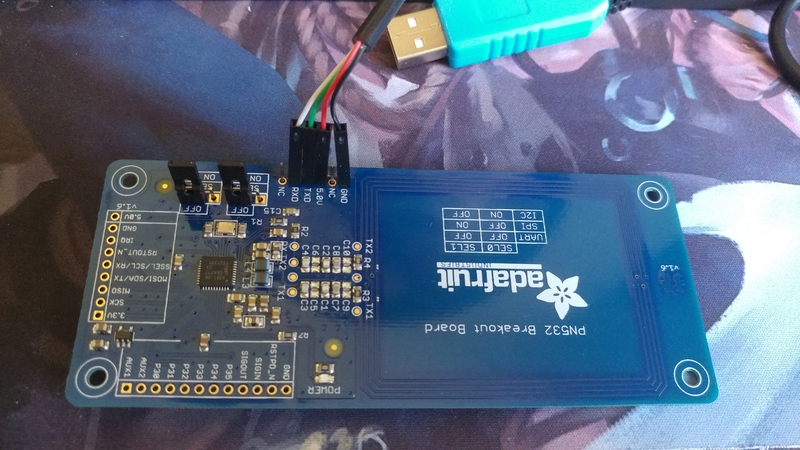 Since this is a project where the goal is to learn, I find it interesting to get to know how the MIFARE 4K tags work. I had done the research before finding an exploit and learned a lot of stuff that weren't needed to crack the tag but still, there's no useless knowledge! The sector trailer is the last block (block 3) in one sector. Each sector has a sector trailer. It contains information to handle the sector access conditions and the secret keys: A (mandatory) and B (optional). The access conditions for the blocks of that sector are stored in bytes 6...9. The access bits also specify the type (data or value) of the data blocks. There is a lot more to learn in this document and many others you can find on the Web. Due to the fact that the MIFARE 4K isn't a secure product, finding an exploit didn't take long. The challenge is to crack the keys to get read and write access to the tag. Fortunately - or unfortunately - the MIFARE tags security has been compromised in 2007 and 2008. First, Nohl and Plötz presented at Computing Community Consortium a partial reverse engineering Crypto-1 (the cryptography used by MIFARE Classic tags), putting forward some weaknesses. Then, in 2008, In March 2008 the Digital Security research group of the Radboud University Nijmegen made public that they performed a complete reverse-engineering and were able to clone and manipulate the contents of an OV-Chipkaart which is using MIFARE Classic chip. Since then, a lot of public exploits to crack MIFARE Classic tags have been developed. We are going to use one of them for this project. To perform this attack, you will need a computer running Kali Linux, a PN532 NFC/RFID controller breakout board and a USB to TTL Serial Cable. You can use any other Linux distribution than Kali but I recommend it or any other Debian-based distribtion. Before getting into the hardware part, we need to configure our operating system so we can read the output of our NFC reader. All right! Everything is configured, next we have to connect our NFC reader. Connect you USB to TTL Cable and connect the black wire to GND, the red one to 5.0V, the green one to TXD and the white one to RXD. You might need to set SEL0 and SEL1 to OFF as shown in the picture. This should display a list of the NFC devices found by your computer. The tag's dump is saved in ./output.dmp and you can open it with hexdump. Before being able to change the block which contains how much money you have, you need to find which block it is. That's quite an easy trick. Rememember everything is saved as hexadecimal values so you have to convert your current money value from decimal to hexadecimal. In my case, I had 9,24 euros, so 9 is 0x09 and 24 is 0x18. But nothing relevant seems to appear. Maybe we have to try converting the total cents value to hexa? 924 is 0x03 0x9C, let's grep on 9C then. It's on Block 1 of Sector 11, remember we count from 0. If you're not sure this is the good block, juste add some money to your card and check again! OK. So far, we used to be on the good side of the law, now it's going to be less legal since we are going to write on the block where our wallet is saved. Please remember to reset this value to its initial value after modifying it. The easiest way to write on a MIFARE Classic tag knowing its keys might be using their own Android app. Remember the keys cracked by mofc? Add them to the MIFARE app in "Edit/Add Key File" so the app will be able to read and write on your tag. Then you can read the tag with the app to make sure everything is fine. If so, just write on the right block with the app (Block 1 of Sector 11 for me) on the bytes assigned to your wallet. The app will let you know everything went well, then you can check your account at the snack vending machine, you are rich! If you read the new tag and compare it to the original one - the MIFARE app has a great tool for that, you'll see that everything is the same except for some unused keys and the first block (Block 0). Do you remember we have already talked about that block? It's the UID block, it contains the equivalent of a MAC address for the tag. It can't be changed because it is secured directly on the hardware. It seems that vending machines check one way or another if your tag is legit using this block, that's why I didn't manage to create a functional copy of my card. But you can buy a UID-writable tag on Internet, it's more expensive than a normal one but it can be useful.